1. Black shell and Colorful LED shoe clip. Ultra Bright LED built-in the clips, 2 different settings--steady and flash. 2 batteries CR2032(included).Weather resistance and fittable for most shoe sizes. 3. TPU texture, Colorful LED latex light tube, curved shape, Moderate hardness and scattered distribution of protuberant needles consists of this wonderful masterpiece. 4. 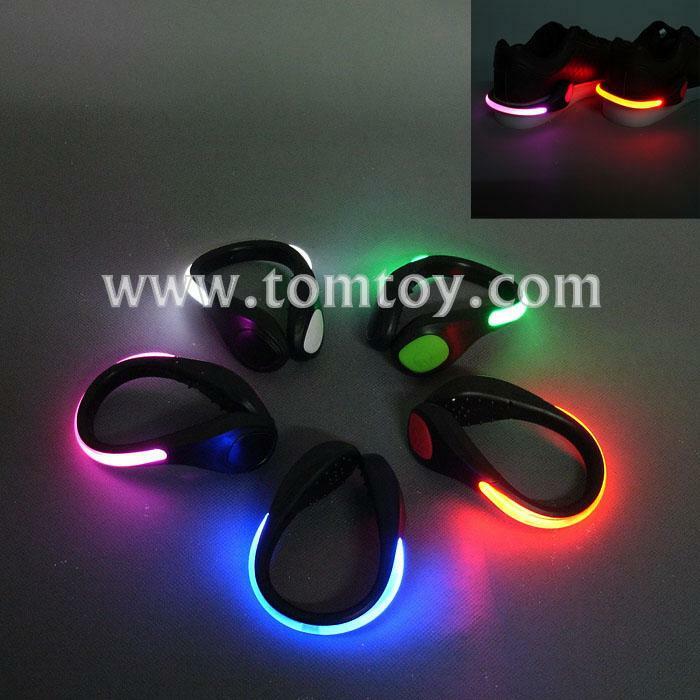 Fashionable and cool design improve our monotonous daily life, just one clip can light up your world with colorful hue. Improve visiblity and safety for you in the dark night.Great alternative to reflectors for night-time safety. 5. Target shoe size heel width : approx.6-8.5cm. Easy on & off with one-click. Available for any weather, even in inclement days.